These tips are sponsored by these national and international sponsors: Infinity Ski Poles, Backcountry Access, Toko Ski Waxes, Rossignol. I thank them for their assistance. If you have a waxing question that you would like help with then send me an email at knicol@swgc.mun.ca Also if you are a manufacturer/distributor of a product that nordic skiers might use then let me know. My qualifications include: Level 4 CANSI Trail Instructor, Level 3 CANSI Telemark Instructor, Level 3 CSIA Alpine Instructor and Level 2 CAA ( Canadian Avalanche Assoc. Certification). At the present time I hold the highest overall CANSI certification in Canada. I have taught in the largest Masters Camp in Canada at Silver Star, B.C. 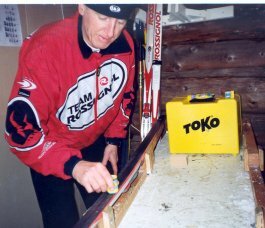 and have helped thousands of skiers from beginner to expert improve their nordic skiing. As well I have been on 4 Canadian INTERSKI Nordic Skiing Demo Teams and run the Winter Outdoor Pursuits Programme at SWGC. Check out the Links above to find CANSI's, INTERSKI's and related WEB sites. NOTE: The MPEG videos are fairly large, and are best viewed on computers on campus. The MPEG video may appear to be choppy if watching from home. If you would like to watch the video on your home machine, try watching the WMV version. Grip waxing your classic skis is easy if you follow these simple steps. First of all, you need to find your grip zone—use the paper test to do this. Next measure the snow temperature with a thermometer to determine which wax you should use. Each wax has a range of snow temperatures over which it will work best. If you use a wax which is too cold, the warmer snow will not ‘bite’ into the hard wax causing you to slip backward. Conversely if you put on a wax which is too warm, the colder snow crystals will too easily grip the wax and your bases will clog up with snow. 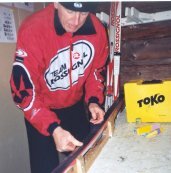 Next, crayon the wax within the grip zone of the ski (roughly the middle third of your ski but use the paper test to accurately determine this) and use a cork to smooth it out. If you plan a longer ski tour then use several thin layers of corked in wax. Also if you are new to skiing-- start by buying a cork and 3-4 grip waxes (from the same company) that cover the typical range of temperatures that you will be skiing in. You can then add more waxes as you become more confident with your waxing. See the Toko web page for more wax information. Many people will hang up their skis rather than use klister. It has a bad ‘rep’ but often it is because skiers do not know how to apply or remove it. Klister is a grip wax which is used for icy snow or corn snow which forms when air temperatures are above freezing. It comes in a tooth paste like tube and the trick is to apply it sparingly and I mean sparingly. I have seen people use half a tube when just a few dabs would have done the trick. 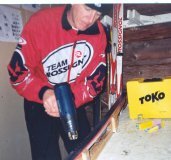 Another trick is to warm klister up with a heat gun after it has been applied to your skis. That way it can be easily smoothed out with a klister spreader or you can use your thumb. If you leave it in big globs it may ice up or grip poorly. A final tip is to remove the klister right away after you have finished skiing. That way it won’t spread to your car seats, your ski bag, your jacket or gloves. I use a heat gun to warm the klister and then remove it with a soft flexing paint scraper. This will remove most of the klister and you can use wax remover to clean up any residue still left on your base. See the Toko web page for more wax information. Many skiers pay a small fortune every winter to have their skating skis glider or hot waxed. However with the purchase of some glider wax, a waxing iron, a nylon brush and a plastic scraper you can do it yourself. You will also need a waxing bench but many ski areas have these available. Like grip waxes the appropriate glider wax is determined by snow temperature. Once you have measured this you then melt on the wax with the iron. It is best to use a waxing iron rather than an old clothes iron since the latter have poor thermostatic controls and surges in heat may damage your skis. Simply touch the wax to the waxing iron and leave a trail of wax drops on the ski base. 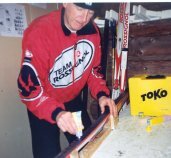 If you are waxing skating skis then wax the entire ski base or for classic skis just glider wax the tips and tails. Use the iron to remelt the wax drops and spread them evenly across the skis’ base. If the wax smokes your iron is too warm. Then let your skis cool before using a plastic scraper to remove the wax. It may appear that you are removing all the wax you have just put on but that is the point. You only want to leave a microscopic layer of wax that has soaked into the base of the ski. Then use a nylon brush to remove any extra wax. And voila you have just glider waxed your skis. See the Toko web page for more wax information.